Today, I'm doing something different for Creativity 521! Instead of sharing a craft tutorial or artwork we did, I'm helping you to get creative! When I mention the words cute, food, creative and kid-friendly, what comes to your mind? It's something I wrote about before and I'm happy to share that I have yet another awesome giveaway for you. In this week's Creativity 521, it's all about bento-making! Bentos are said to be healthy, economical and provide a more balanced diet for the family. While that might remain debatable since the price and calories differ for every bento based on the ingredients, I do very much believe in the 'fun' part of making a bento. By now, you probably know that I very much enjoy crafting over cooking, because I see the former as a way of unleashing creativity and letting my imagination run wild, without worrying if I'm conjuring up poison or something inedible for my kids. The latter, I tend to see it involving more skills, more research and more work needed if you wish to come up with innovative recipes and new dishes constantly. Well, the good thing about bento making is that everything is made so much easier with all the tools! Remember the review about Bento Maker I did which involved cute tools like Hello Kitty bread punch, animal stencils and even a pop-up bear punch? It's probably not a surprise that many of their items are hot-selling and some have even run out due to overwhelming orders. For me, bento making serves as a great way for my girl and I to get creative together in the kitchen. It not only enables us to bond, but it is also a good way for her to train up her fine motor skills too. Yes, let me tell you first, those seaweed eyes and whiskers can be very tricky! Not forgetting that there is always a sense of achievement that comes when you see your end product. This bento set was what we did previously and with a stroke of luck, it also enabled us to emerge as the champion in a bento-making challenge hosted by AIA Vitality last year. I must frankly say I doubt I would have made it if not for the adorable animals which won the hearts of many in the audience. I mean, seriously, a penguin rice and a bunny egg? How kawaii is that? So, even if I don't make bentos as often as many other passionate mums, I do have a stash of all these bento making tools at home (many of which were previously bought in Daiso or on Ebay). You just never know when inspiration might hit and you would like to get creative in the kitchen for a change, right? 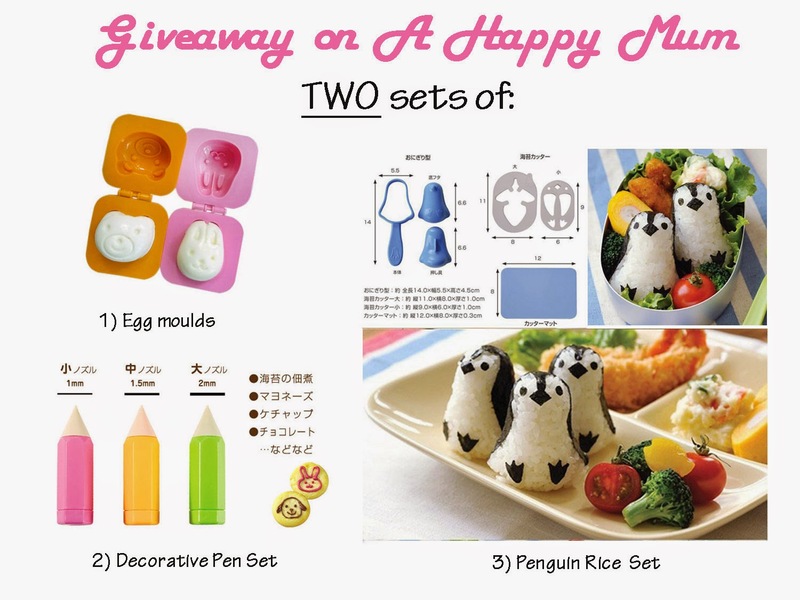 For those of you who wish to own more cute bento-making tools, here's what you can win from Bento Maker! 1) Hard-boiled eggs are one of my kids' favourite, be it for breakfast, lunch or dinner. These Egg Moulds just make them so much more tempting to eat and I'm amazed by how easy they are to use. 2) I also love the Decorative Pen Set and have chosen to include it for you because it kind of feels like art, where you can write or draw anything you want using food as your 'canvas' and ketchup or other sauces as your 'ink'. Special, right? 3) My personal favourite - the Penguin Rice Set! It might seem a little complicated on the first try but it gets easier with practice and soon you'll be serving these cute seabirds to your kids! This giveaway is open to all readers with a valid Singapore address for delivery. To participate, leave a comment in this blog post with your name, email address and share with me why you like bento making. Indicate in the Rafflecopter widget that you have commented and follow the rest of the steps if you wish to increase your chances of winning. Best of luck! a Rafflecopter giveaway Disclosure: We received the above listed bento-making tools for review purpose from Bento Maker. All opinions are my own. Lovely! Cute bento-making tools.. Hope to win. So I can make lovely bentos for my gals lunch box at school. My children love cute bentos! Thanks for hosting the giveaway! Please pick me so that my girls and I will have lots a fun creating our little bento foods. I'm a great fan for such cutie stuffs. My boy's appetite will be better if I make the meals to look nicer and cuter. This is also a great way to get him to eat more veg. My fussy boy is hard to feed, hope to win this set to spin up food that can attractive his appetite. I love bento making with my children together because it's fun. Our family are into budget and healthy eating and always try to eat at home as much as possible since I became a stay home mum. When we do go out, we like to pack food or snacks when we go for a walk and sightseeing. My son loves animals and this would be a great way to encourage him to cook and eat together as well. my 2 kids are picky eaters especially when it comes down to their VEGETABLES hoping these cute bentos will "trick" them into liking their vegs!!! I have been packing cute bentos for my older girl for 2+ years. She finally outgrown them but I have 2 more kids! You are right, one can never own too many bento tools ��. So I hope to win this giveaway. I love bento making because my 3 lovely kids enjoy the activities! I like bento making because it will add "variety" to the food we are introducing our boy. I love bento making because it makes me happy just by looking at the end product and it also excites my little gal so that she enjoy her mealtimes even more! I love bento making because my gal will eat whatever food u serve her with when I doll up the food! She use to only eat plain rice! When I showed him this post he is so happy n I asked him if he wants it. He said yes loud n happy. 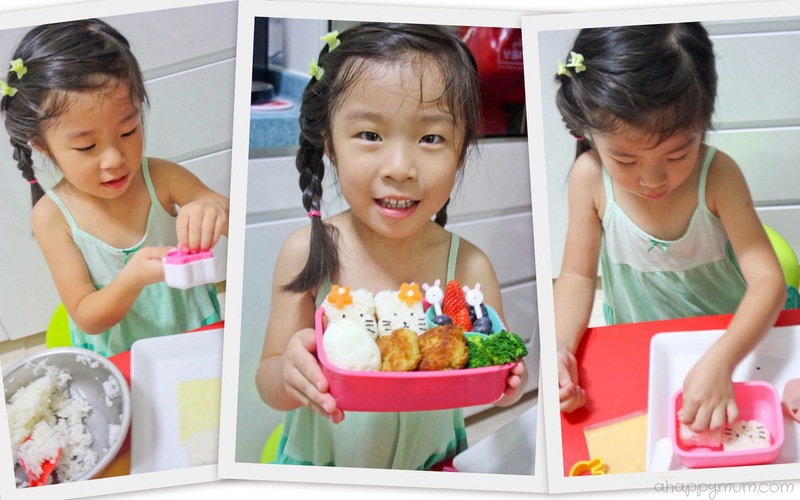 I can have a fun & bonding session with my girls creating hearty & healthy bento together. I like bento-making because it makes my boys think that their daddy is not just a good cook but can also make his food look cute! I love bento-making as it makes me happy looking at pretty food and even happier when my kids eat them joyfully. This is an awesome idea to make eating fun for kids! My son was just diagnosed with ADHD yesterday and because of his problem, he has sensory processing disorder which resulted him in having problems with weight. He is only 16kg at P1 age which is super underweight. I always wanted to come out with cute bentos to attract him to eat more.Thus would really hope to win this! I love Bento making as it's home made and healthy. I can choose what my kid can eat. My boy eats anything that's attractive. Definitely healthy with the vegetable i add in and he loves to share with us. I have been trying to get my boy to eat his breakfast before going to school. He only recently starts to eat his bread after I made some simple design to his food. So, I hope to win these to entice him to eat his breakfast more willingly!! !